If you are interested in Bonsai and want to learn more, why not come visit us for "Bonsai Experience". After the brief lecture on Bonsai basics, now it's time to make your own Bonsai! Cost: 3,800yen including entrance fee of the museum. Additional cost will be required if you want to take the Bonsai home with you. 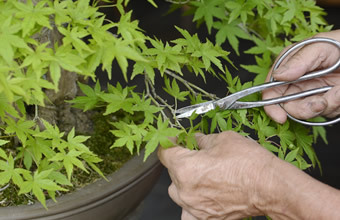 we offer chances for anybody to join us if you are really serious about Bonsai. Here we accept people not as a guest nor as a student, but as one of our member. This means while we do our own business, you have to learn by yourself through observing us, doing as we do, eating, sleeping, and working together with us. We recommend you to stay at least 1 month but shorter term is also acceptable. The cost would be 100,000JPY per month, including accomondations and 3 meals per day. You'll work with Kunio Kobayashi and his apprentices everyday, and get certificate at the end. Hi, I'm Shimo from Japan (but as an international apprentice). I'm 23 years old universitiy student, who spent 1 month at Shunkaen in March, 2016. I learned lots of things there and had a great time, and now I'd like to share a bit of what I found. For me, it was more like internship rather than Bonsai school as we can get into the actual life of Bonsai artists. Once you arrived, you have to open your eyes and learn by yourself, then you'll learn more than Bonsai techniques.